“High-brass firepower is the theme of Trumpet Summit Prague, and there’s plenty of the good stuff to go around, thanks to the on-point playing and improvising of a trio of trumpeters. Here, American players Randy Brecker and Bobby Shew, and Jan Hasenöhrl, founder of the Czech National Symphony Orchestra, join forces with the CSNO and St. Blaise’s Big Band in a 2012 concert at the celebrated Smetana Hall. East Meets West w/ Randy Brecker Ada Rovatti, Mike Stern, Kazumi Watanabe, Terumasa Hino, Will Lee and More! Over the last three decades. 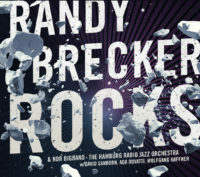 Randy and Michael Brecker have carved out an indelible niche in the world of music.